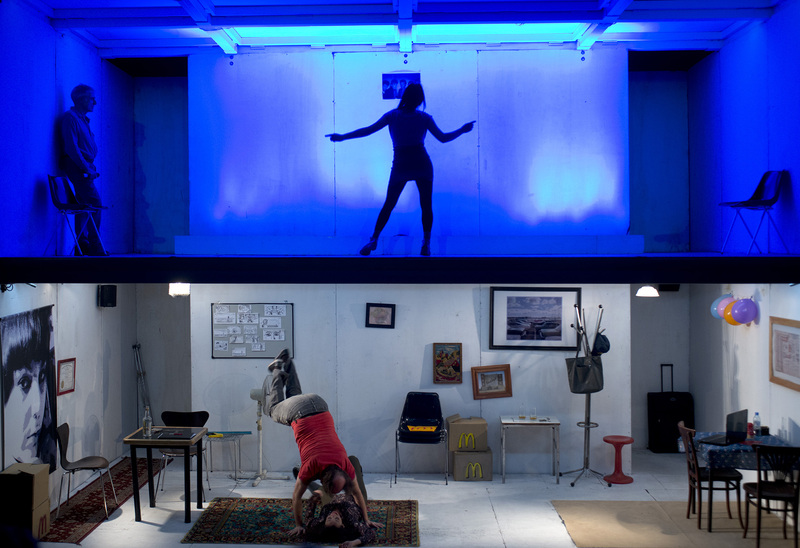 In his fifteen-year career, Mariano Pensotti has become a staple of contemporary Latin American theater, and he contradicts the persistent belief that it is an emerging art form. Now foremost a playwright and director of live theater, Pensotti received his formal education primarily in visual arts and cinema. Introduced to theater only later in his formative years through experimenting with acting, his many productions represent the breadth and depth of many influences. Working often simultaneously as playwright and director, Pensotti interchanges techniques, combines audio and visual elements, and often blends genres, melding dance, theater, literature, music, and above all cinema into his works. Cineastas is no exception. A tribute to film on stage, it follows the lives of four filmmakers in the process of creating their own films, and explores the passage of time, the influence of fiction on reality, the (fictional) portrayal of a city — in this case Buenos Aires — through (fictional) characters, and the contrasts between the ephemeral and the permanent. All of this is represented on a complex two-level set designed by Mariana Tirantte, one portraying the lives of the filmmakers and the other the films they are producing, allowing for interaction between the two. This literally and figuratively multilayered production debuted in 2013 and will be performed at the Walker this week as part of Out There 2015. Likely a reflection of his multifaceted education, much of Pensotti’s approach to creating work is based on experimentation and combination. In an interview with Julia Elena Sagaseta in 2010, he explains the approach to creating some of his earlier works by “searching, trying, succeeding in some things and failing in others… a process of creation very much connected in actually doing. I come from a generation very influenced by the ‘punk’ and ‘do it yourself’ spirit, and my formal education rather fell to the wayside. For me, it was always very important to do many things” (translation mine). One need merely head to Pensotti’s website, where poetic descriptions outline the many productions on his resume, to see what he’s referring to: Night at the Waterfalls (2003) includes video projections on performers’ bodies so “the same body is used for two juxtaposed forms of the same character”; Dirty (2007/2009), a “strange musical about masculine anguish” blends dance, theater, literature and music; Interiors (2007) takes place within a real building set up with fictional situations in separate rooms, wherein the theater is “a film set in which the spectator is the camera”; and Disco (2007), set in a disco with transparent walls in which playwrights write short texts in live response to particular music being played, while video projections portray the playwrights and the actors within the disco. “The film on stage opens up ‘a space within the space.’ It functions as a metaimage that interacts with the scene in multiple ways. Though this may be the most common and direct way to incorporate the use of both mediums, it is not the only way. [The Past is a Grotesque Animal (2010/2011)] is unique because of the multiplicity of modes and perspectives with which it establishes the intersection between theater and cinema…it offers a provocative opportunity to explore the possible relationships between both languages [theater and film] in many ways, including quotes, the thematic relations, construction of imaginaries, visual content, and as a language whose grammar is appropriate for the scene.” (translation mine). Pensotti’s last visit to the Walker was in 2012 with Grotesque Animal, which formed part of Out There 2012: Global Visionaries. Based on the song of the same name by Of Montreal, The Past is a Grotesque Animal focuses on the parallels between city and individual, and on the interplay between fictions and specific narratives. Voiceovers narrate the past, and as Pensotti notes on his website, these “could give sense to the scattered fragments of a film that is lost forever. The past is like a strange animal which should be invented and trapped following blurred traces.” The use of cinematic elements, while not always including the use of video outright, has become a signature of Pensotti’s craft. Are our lives actually the vehicles through which works of art become eternal, making us repeat the things that we’ve seen in them hundreds of times before? Do our fictions reflect the world, or is the world a distorted projection of our fictions? How do life and day-to-day experiences influence fiction, and above all, in which way has fiction then been the starting point from which our lives are constructed? Cineastas will be performed at the Walker Thursday–Saturday, January 22–24, in Spanish with English surtitles.